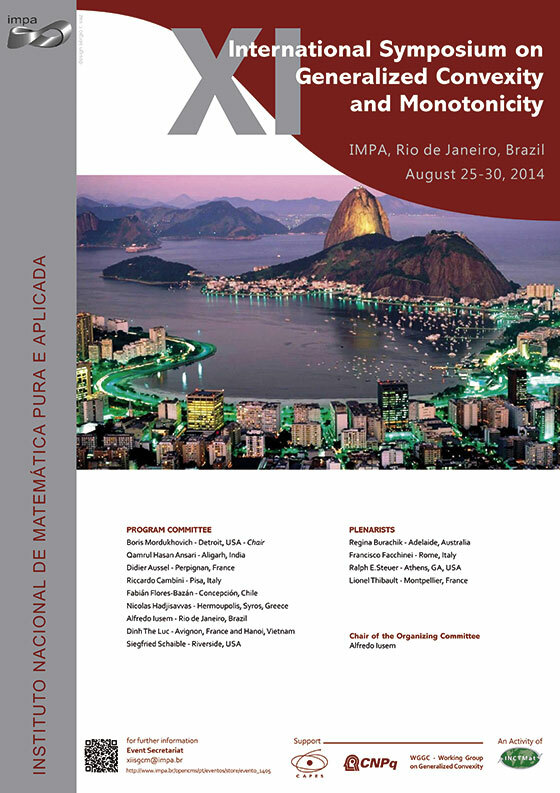 IMPA, Rio de Janeiro, August 25 -30, 2014. The XI International Symposium on Generalized Convexity and Monotonicity will take place at the Instituto de Matematica Pura e Aplicada (IMPA), in Rio de Janeiro, Brazil, from August 25 to August 30, 2014. The Symposium is sponsored by the Working Group on Generalized Convexity, and is the 11th meeting in a series which started in Vancouver, Canada, in 1980, and continued in Canton, USA (1986), Pisa, Italy (1988), Pecs, Hungary (1992), Luminy-Marseille, France (1996), Karlovassi-Samos, Greece (1999), Hanoi, Vietnam (2002), Varese, Italy (2005), Kaohsiung, Taiwan (2008) and Cluj, Romania (2011). See the Working Group’s site (www.genconv.org) for more information on other activities. The symposium will consist of plenary lectures, offered by invited speakers, as well as contributed talks, of 25 minutes each. I) A welcome cocktail, will be offered free of charge to all participants and spouses on Monday, August 25, at 6:00 PM, at the IMPA premises. II) On Wednesday, August 27, there will be a full day excursion, sailing on a boat across the tropical islands of the Sepetiba Bay. The excursion fee is US$55.00 or R$125,00 and it includes transportation and lunch at Araçá Beach at the Jaguanum Island. A bus will leave Acapulco Hotel http://www.acapulcohotel.com.br/ located at Rua Gustavo Sampaio, 854 – Copacabana – at 9:00h sharp and will return to the hotel after the tour. Those participants that would like to join the excursion please inform in advance through the e-mail address eventos@impa.br and pay the fee until Tuesday , August 26, at noon. III) On Thursday, August 28, at 8:30 pm the workshop dinner will take place at Restaurante Americana, Av. Rainha Elizabeth 100, Copacabana. http://americanarestaurante.com.br/ The dinner is free for registered participants and the price for spouses will be R$80.00 (US$40.00). Please confirm your participation in the dinner until Tuesday August 26, at noon. 2 bottles of mineral water or 1 beer (additional beverages must be paid by each participant).